Offering Envelopes is rated 4.2 out of 5 by 6. Make it easy for your congregation to give by providing custom offering, remittance or tithing envelopes. Offering Envelopes are a custom option but you can still get instant quotes and place your order online. Just follow these guidelines. Call or email spreadtheword@printplace.com with any questions – we are happy to walk you through the options. Rated 5 out of 5 by Ms B from Tithes Envelops I bought these last month and they were great. I will reorder soon. Rated 5 out of 5 by Clay from So great! Great service! Great product! Great timing! Look forward to ordering more! Rated 5 out of 5 by PBCC from Excellent in every way Our custom offering envelopes printed at PrintPalace are excellent quality in printing and paper for a really good price. The staff is friendly and knowledgeable about the print process. We've recommended PrintPalace to other churches for thier offering envelope needs also. We are very pleased with PrintPalace! – we are happy to walk you through the process. 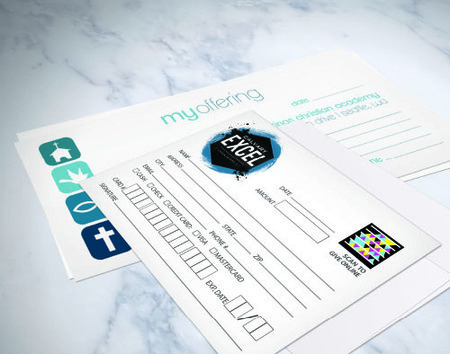 PrintPlace.com has layout templates to help you create offering envelopes to our printing specifications. There is a layout template for each envelope style, so they are easy to follow. Download the one that fits the envelopes you’re printing, to show the correct bleed, blank address area, and more. Offering envelopes offer the ability to promote your message and need, and give the recipient the option to include a donation. You can even offer an option to fill out credit card information for easy giving even without a check or cash. The full flap gives you the option to design any personal information to be hidden by the flap when closed.